His Highness Sheikh Mohamed bin Zayed Al Nahyan, Crown Prince of Abu Dhabi and Deputy Supreme Commander of the UAE Armed Forces and President of Egypt Abdel Fattah el-Sisi, discussed the fraternal relations between the two countries and ways to enhance them as well as the overall regional and international issues of mutual interest. This came when President el-Sisi received today Sheikh Mohamed and his accompanying delegation at Al-Ittihadiya Palace in Cairo. They discussed cooperation in various political, development, economic, and investment domains and ways to continue developing it to meet the aspirations of the leaderships and the peoples of the two countries into wider horizons to achieve joint interest. Sheikh Mohamed congratulated el-Sisi on winning his second term in office during the elections held recently and the Egyptian people's confidence for a new stage of security, stability, development and achievement. He said that the great popular turnout witnessed in the elections demonstrates the Egyptian people's solidarity with its wise leadership and support for all its efforts to achieve security, stability and development for Egypt. Sheikh Mohamed wished the Egyptian President good luck and success in his efforts aimed at continuing the drive for development and building so as to achieve the aspirations of the Egyptian people. He also conveyed regards of President His Highness Sheikh Khalifa bin Zayed Al Nahyan as well as his best wishes of more progress, development and prosperity for Egypt. Sheikh Mohamed emphasised the UAE's desire, under the leadership of Sheikh Khalifa, to develop ties with Egypt into the highest levels of co-operation, co-ordination, unifying visions and stances towards various regional and international issues to achieve the aspirations of the two fraternal countries and enhance pillars of security and stability in the regions. He also renewed the UAE's unwavering stance in support of Egypt, while pointing out that Egypt was and still the cornerstone of the Arab and regional security system and its strength is the source of power for all the Arabs. Sheikh Mohamed also stressed that the rapid developments taking place in the Arab region call for continued co-ordination and co-operation among the Arab countries to reach out unified stances and policy to address the challenges facing the region, whether they are related to the threat posed by extremist, terrorist and violence groups and the powers supporting them or related to the interference of some regional powers in the Arab affairs as well as how to deal with the burning crises in the region, in order to enhance the Arab national security and achieve development and stability for all the peoples of the region. The Egyptian President emphasised the keenness of Egypt to continue developing the framework of joint co-operation with the UAE in various fields. He pointed out that ties between the UAE and Egypt represent a role model of constructive strategic co-operation between the Arab countries, highlighting the efforts exerted by the UAE to promote joint Arab action. El-Sisi asked Sheikh Mohamed to reciprocate greetings to President Sheikh Khalifa and wished him good health and more progress, development and prosperity to the Emirati people. 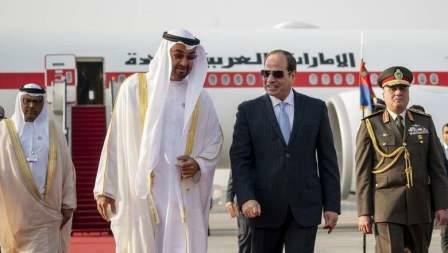 The two sides stressed that the UAE-Egyptian relations are based on strong foundations and come in the service of Arab political, security, economic and development issues and are a safety valve in co-operation and co-ordination with the fraternal peoples in the face of the challenges facing the region. At the end of their meeting, the two sides called for joint action in order to preserve the unity and sovereignty of the countries facing crises and safeguard the potential of their peoples as well as support development and construction. The two sides also confirmed the importance of co-operation and the concerted efforts of the international community and the Arab countries to combat the terrorism and extremism scourge, especially the efforts related to stopping financing terrorist groups, providing them with fighters, weapons, and providing safe haven as well as political and media coverage. The meeting was also attended by government officials and dignitaries on both sides.